The Smithsonian’s National Air and Space Museum will host a robotics program April 5 in Washington, D.C. A full day of activities and presentations will take place between 11 a.m. and 4 p.m. and will have two themes: robotics and young people and the current state of robotics in space. This educational program is an official event of National Robotics Week, April 6–13. The National Air and Space Museum is presenting this symposium in partnership with NASA, Defense Advanced Research Projects Agency and Infamous Robotics LLC, a private corporation that uses curricula it has developed to successfully educate children about robotics engineering and the related STEM (science, technology, engineering and mathematics) fields using a hands-on approach. Presentations will take place in the “Moving Beyond Earth” gallery, an immersive exhibition that places visitors “in orbit” in the shuttle and space-station era to explore recent human spaceflight and future possibilities. The developmental NASA/DARPA Robonaut 1A and the DARPA Autonomous Robotic Manipulation robot “Robbie” are both on display in the exhibition to illustrate how robots can aid humans in space. Students from five college robotics teams will describe each of their teams’ project objectives through commentary and supporting media of their creations. The college robotics teams will demonstrate their projects to the public and Museum Education staff and Infamous Robotics will perform robotics demonstrations for a younger audience. In addition, DARPA roboticists will be presenting demonstrations of the DARPA ARM robot in the Moving Beyond Earth gallery. Sharing Space: The Human–Robot Partnership; 3 p.m. – 4 p.m. Experts from the field will present an overview of the current and future uses of robots in space. Topics include how humans use robots on the Space Station, Mars exploration with the Curiosity rover and possibilities for better robots in the future. A question-and-answer session with the audience will follow. 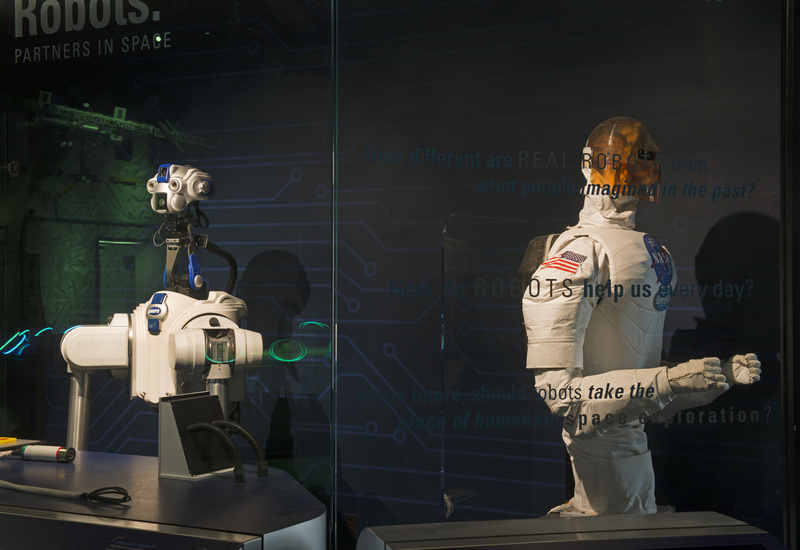 The DARPA Autonomous Robotic Manipulation robot “Robbie”developmental and the NASA/DARPA Robonaut 1A are both on display in the Moving Beyond Earth gallery.